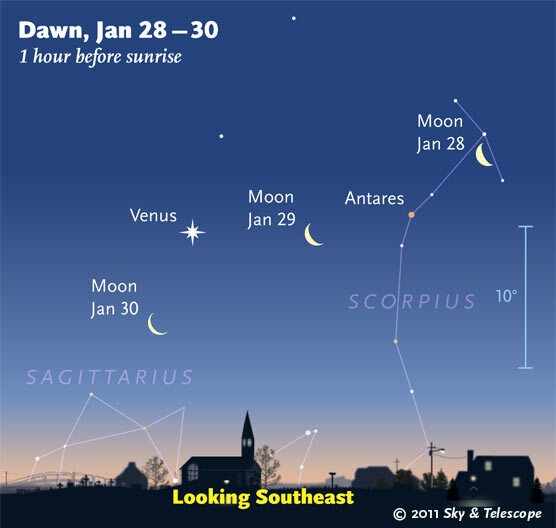 Moon and Venus Saturday/Sunday morning If you happen to be awake Saturday or Sunday morning at around 6:30AM, and the sky is reasonably clear, look to the southeast for a pretty view of the waning crescent Moon and the planet Venus. 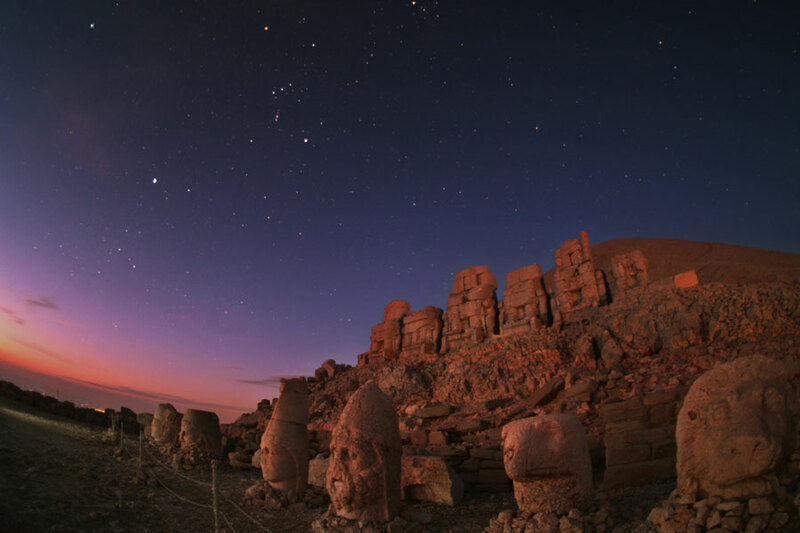 Another view of Orion Image of Orion over Mount Nemrut, Turkey. Mount Nemrut is adorned with ancient craved statues, some of which can be seen here. In the sky, you can see Sirius, the brightest star in the night sky, below and to the left of Orions left foot. Sirius marks the head of the constellation Canis Major (the Big Dog). The Greeks said the Big Dog was one on Orions hunting dogs. Seasons. 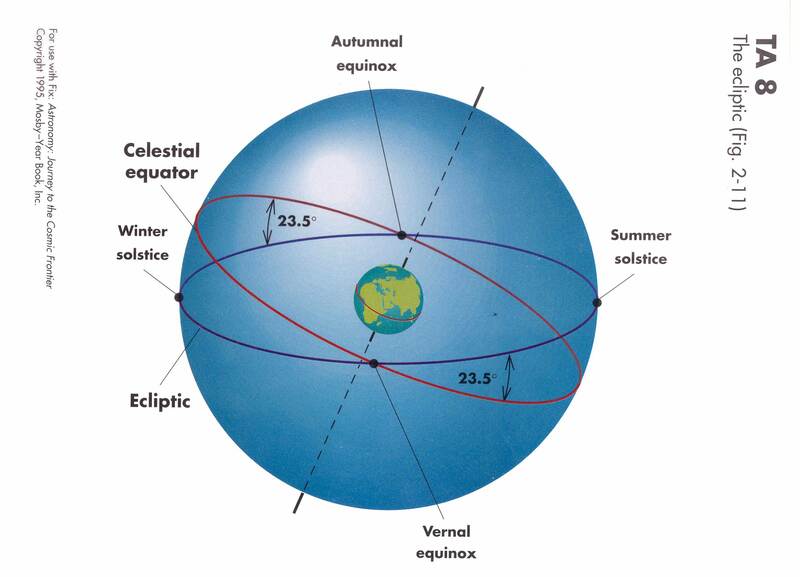 The Earth experiences seasons because of the tilt of the Earth's rotational axis by 23.5 degrees from the perpendicular to the plane of the Earth's orbit around the Sun. Seasons and Earth-Sun distance This shows two photgraphs taken of the Sun - one in early January, the other 6 months later in July. 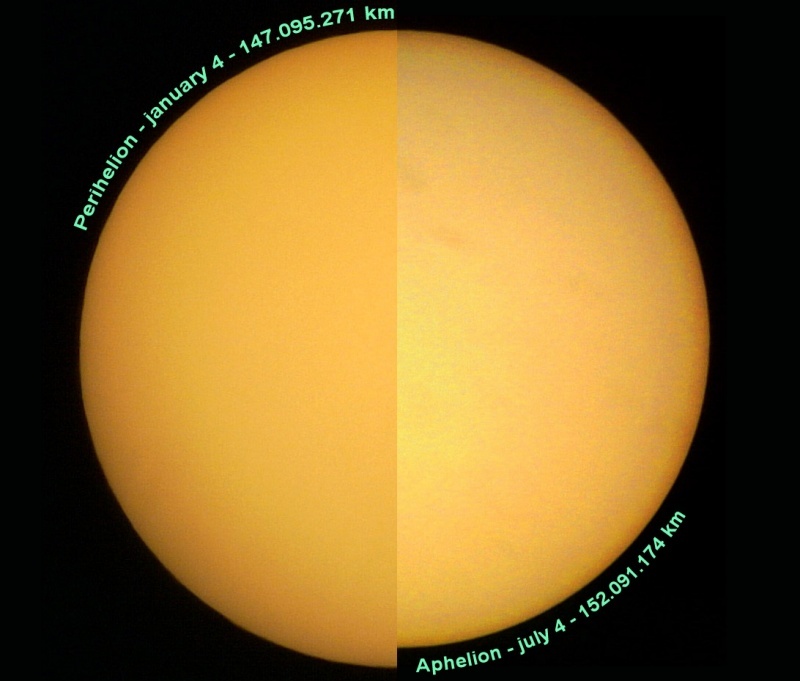 The January photograph shows that the Sun LOOKS LARGER IN JANUARY THAN IN JULY. This means that the SUN IS CLOSER TO US IN JANUARY THAN IN JULY! So, this means that summer is NOT due to Earth being "closer to Sun" than in winter. In fact, exactly the opposite is true! We in the northern hemisphere are closest to the Sun at the coldest time of year. Path of Sun in sky. As the Earth revolves around the Sun, it appears to us that the Sun moves in a great circle. Constellations of the Zodiac. 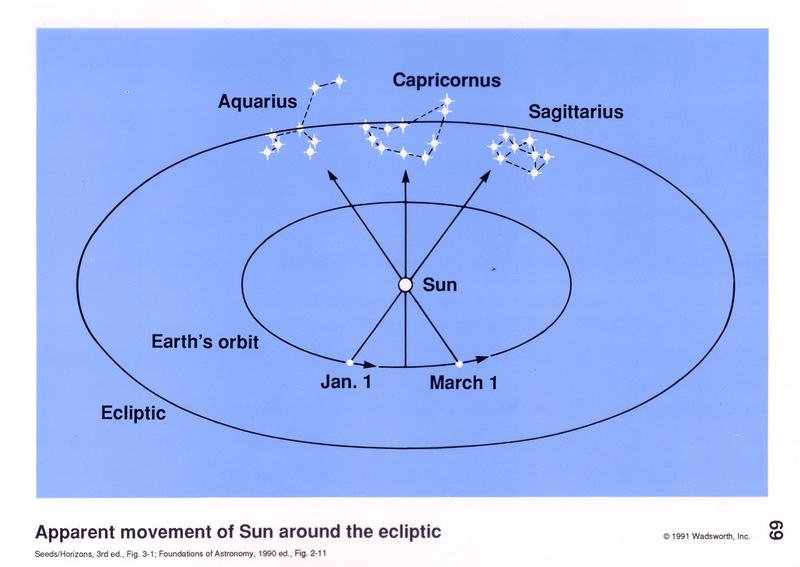 If you could see the stars in the daytime, the Sun would appear in different constellations as it moves around the ecliptic. We say the Sun is "in" the constellation it appears in front of. General Properties of Sky. 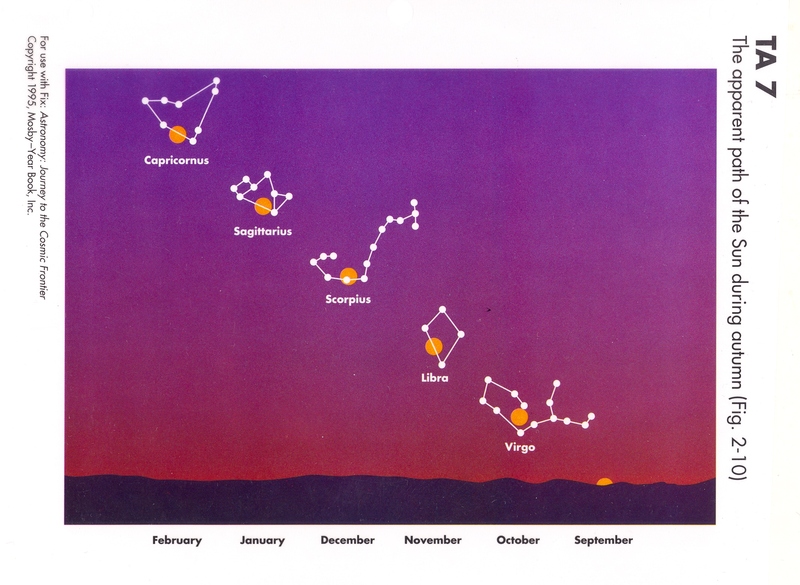 This shows path of objects at several spots in sky as seen by an observer at mid-north latitude (like Norman). If the observer looks towards the north celestial pole, she will see the North Star just sitting at one spot. 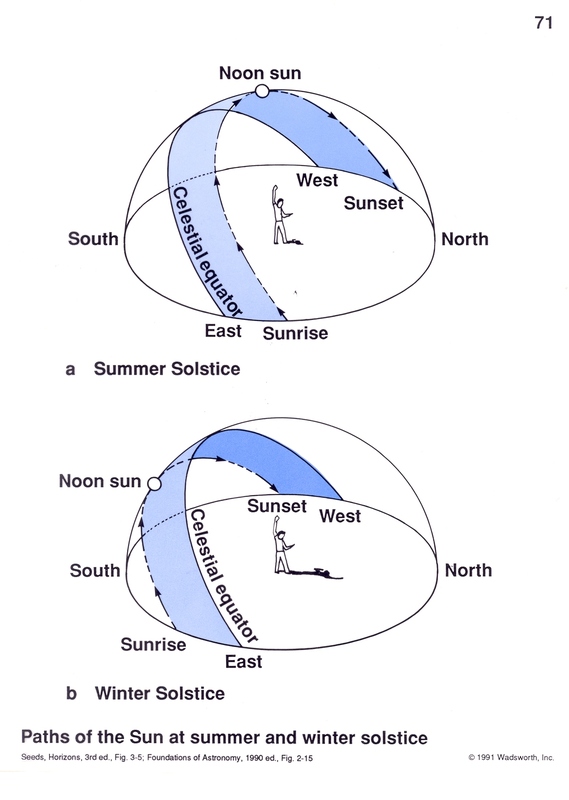 If she looks at an object on the celestial equator (longer curved dashed line) the object will appear to rise directly in east, rise for 6 hours (rising motions), then start setting (setting mothions) until it sets directly in west 12 hours after it was first visible in the east. 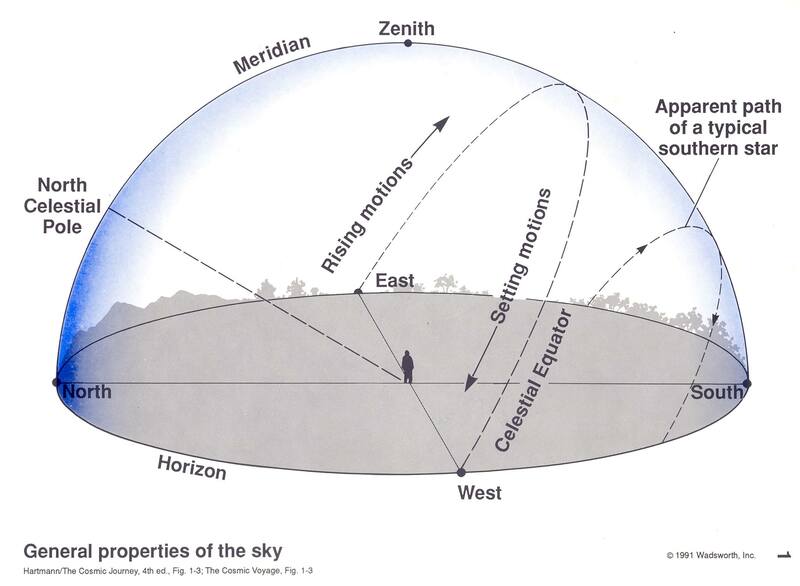 ANY OBJECT ON THE CELESTIAL EQUATOR WILL BE VISIBLE (above horizon) FOR 12 HOURS or 1/2 day. The shorter curved dashed line (Apparent path of a typical southern star) shows the path across sky of a star south of the celestial equator. Such an object is visible for LESS than 12 hours, as we see less than half its total daily motion. Sun at soltices. 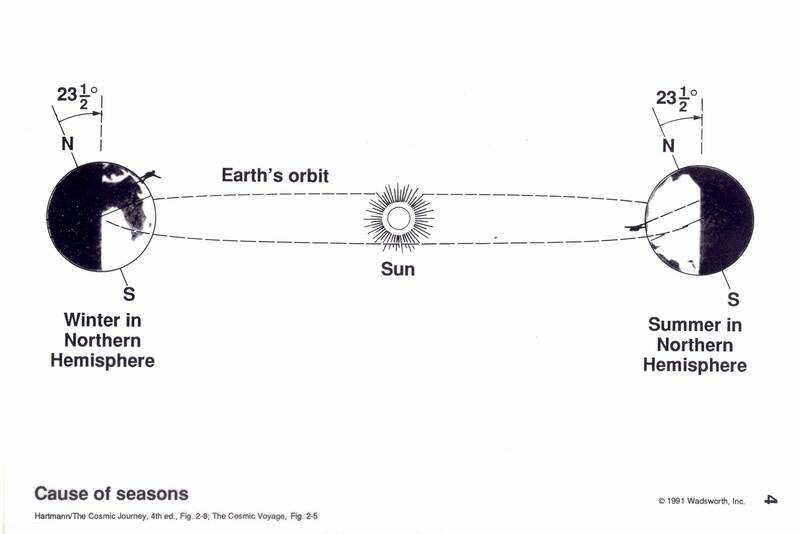 At the time of summer solstice (around June 21 for us in northern hemisphere) the Sun is farthest north of the equator, sunlight is hitting us most directly, and the time the Sun is above the horizon is greatest. At winter solstice, the Sun is farthest south of the equator, Sunlight hits us at a large angle from the vertical, and the Sun is above the horizon the least amount of time possible. Note the lengths of the shadow of the figure. At local noon at the summer solstice (from Norman at latitude 35 degrees) you would have a short shadow extending to the north. At local noon at the winter solstice, your shadow would be much longer, as the Sun is much lower in the sky. Only if you in the Tropics (zone with latitude between -23.5 and +23.5 latitudes) can the sun ever be at the zenith. Coldest day and winter solstice.. Each "x" is the average (over 30 years) average daily temperature for December and January at Norman. You can see that, on average, the coldest day is usually around 10 January. However, we in the northern hemisphere get the smallest amount of sunlight at the time of the winter solstice (around 22 December) when the Earths northern hemisphere is most tilted away from the Sun. But the atmosphere continues to cool even as the amount of sunlight increases because it takes a while for the ground to heat up due to thermal inertia, and so the temperature lags the solar energy. In the summer the lag is even bigger- most solar energy arount 22 June, but the hottest days are around the end of July or even beginning of August. Seasons and hours Sun above horizon This is a set of images of Sun taken every hour on 3 different days: top set taken on the summer solstice (June 21) middle one taken on vernal equinox (March 22) and bottom set taken on winter solstice (Decemebr 22). These were taken with a "fish-eye lens" which captures an image of the entire sky, but with some distortions. These are shot at a latitude of 40 degrees north, from Bursa, Turkey. 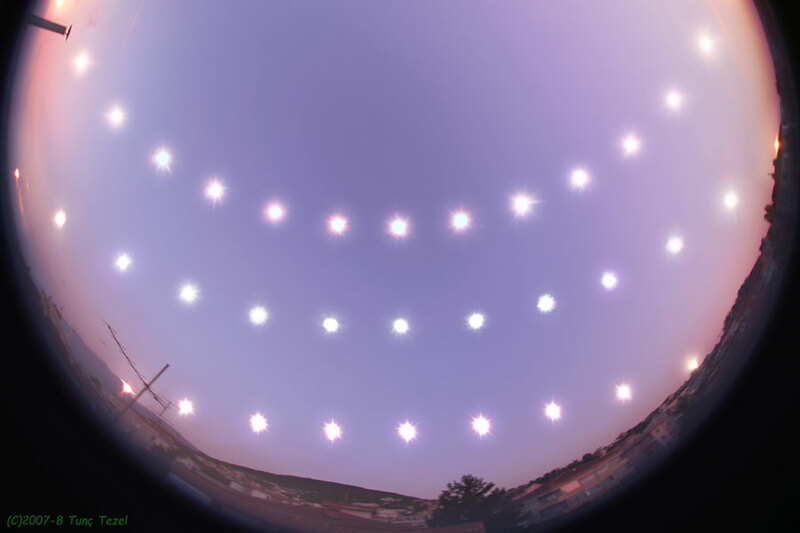 By counting the number of Sun images, you can see that the Sun was above the horizon for about 8 hours in the bottom set of images (winter solstice), about 12 hours in the middle set (equinox) and about 14 hours in upper set (summer solstice). Also, the fact that the maximum angle between Sun and horizon (near middle of each set) is lowest for the winter solstice and highest for the summer solstice is easily seen. At Norman, our latitude is 35 degrees, so the time of Sun above horizon is a little different from the photo, but the basic idea is the same. For Norman, the Sun is above the horizon about 9.7 hours on 21 December and 14.5 hours on 21 June.